While Philip Deaver disappeared upstairs for several hours, the authors all focused and wrote. I was pleased to see that five out of six were using pen and paper as the chosen method of writing. 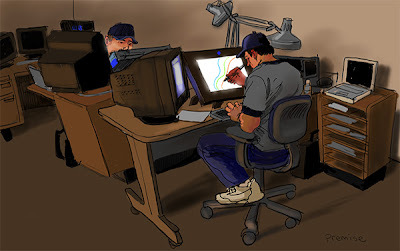 The only computer that was being used was in the far corner of this table and can not be seen in this sketch. Some authors consulted with Philip for one on one advice but for the most part everyone was strictly focused on the task at hand. 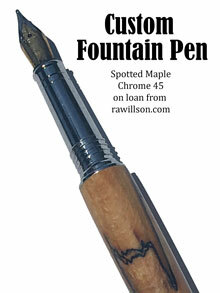 One person commented that drawing authors writing must be like watching paint dry. I found the opposite to be true. I found it to be an absolute thrill to be in the room with so many creative people pushing toward a common goal. There was no mindless chatter just the sounds of pens on paper. Once in a while someone would get away from the table and stretch like a prize fighter and then go back for another round. When Philip returned he asked people how they were feeling about their progress. The goal for the next meeting was to be half way, or have thirty pages written. He stressed that in the beginning when you are trying to figure everything out progress is slow but once the project is up to speed things move fast. His analogy was the space shuttle. Lift off seems agonizingly slow but once the rocket is in orbit it moves at an astonishing 17,000 miles an hour. Since the workshop Jana has expressed an interest in collaborating on future stories so that could spur me to push myself in new and unexpected directions. She had a list of interviews lined up that astounds and inspires. It was only 4 days ago that I wrote in a post that I need to get out and meet people and listen to their stories. Life has a way of amazing me. One quote from Phil really sticks with me "The end is not the goal, the journey is the goal." 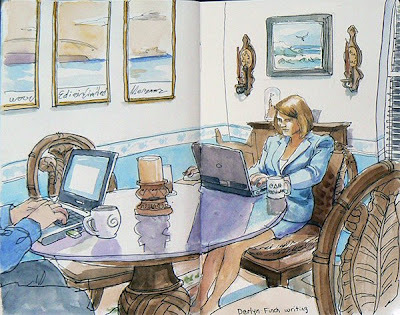 Mary Ann de Stefano invited me to sketch at a novel writing workshop being run by Philip Deaver. The workshops meet monthly on Sunday afternoons for six months. Philip offers encouragement and insights then lets the authors work for several solid hours. I arrived a bit early. Mary Ann and I finally had a few minutes to sit down and talk face to face for the first time. She has followed this blog for a while. She saw a drawing I did of Darlyn, a past resident author of the Kerouac House. On a coffee mug in that sketch, I had drawn, Mad About Words. As it turns out Mary Ann is the founder of that organization and that tiny sketch of a mug has brought us together. It had not rained in Central Florida for months. As people started to arrive it started to pour outside. A quiet knock sounded at the sliding glass back doors and there was Jana Waring in her wheelchair soaking wet. Mary Ann rushed to let her in and before Jana even had a chance to dry off she was introducing us. Jana brushed a wet strand of hair away from her face and we shook hands. She apologized that her hands were still wet. 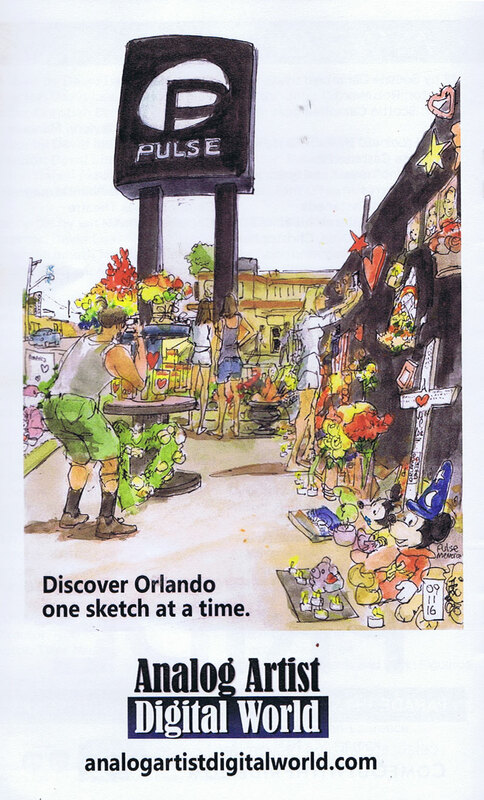 Mary Ann had already been bragging about Jana's web site which consists of in-depth interviews with everyday Orlando citizens. Jana told me about how one interview with Jaqueline Siegel had caused a bit of a firestorm because Jaqueline is married to billionaire David Seigal and she was complaining about having to cut back to 5 nannies. I was fascinated, perhaps a bit envious, that this soft spoken young woman had gotten such an amazing story. When she said that her site had "taken on a life of its own" I knew that I had run across a kindred spirit. I sometimes explain to friends who ask, that my blog has taken on its own life and I am just trying to keep up. So within minutes of meeting Jana, I was on my knees showing her a sketchbook and suggesting that a collaboration might be an interesting prospect. I don't know if I sold her, but I was sold with the first wet hand shake, and when I started to read her work online. I went to an event called Mills 50. When I got to the location, called Cameo, there was a crowd outside. I made my way inside got a wrist band and was surprised when I was greeted by and old friend from my Disney Days named John Hurst. Not only had I known John from Disney but his dad taught me history in High school in New Jersey! It turns out John and his wife had bought the building on a leap of faith and turned the ground floor into an entertainment complex. John told me that the building opened on Christmas day in 1940 as a movie house. Today the ceiling has been lowered to add another floor. John has his freelance animation studio on the second floor and rents out other offices to entertainment companies. The interior of Cameo is a hip industrial complex of exposed brick and ceiling beams. An arched line on the wall hints at where the movie theater seating used to be. The evenings entertainment consisted of folk singer Kaleigh Baker who's warm inviting voice greeted me when I first entered. The Black V Tribal Dancers were sitting to my left while I was sketching. There exotic belly dancers outfits caught my eye but I was committed to this sketch and it looked like they might be the next act on stage. Sure enough they went up and danced and gyrated to the whoops and screams of a very pleased crowd. The last act I saw was Beef Wellington and Divinci they played the keyboards to the right in the drawing. Divinci, who I didn't draw, played the keyboard for a solid 10 minutes with his face which was to say the least very amusing and entertaining. I fell in love with this place. It has the best of art and entertainment. It is raw, exposed and very real. I suspect I will be back many times. 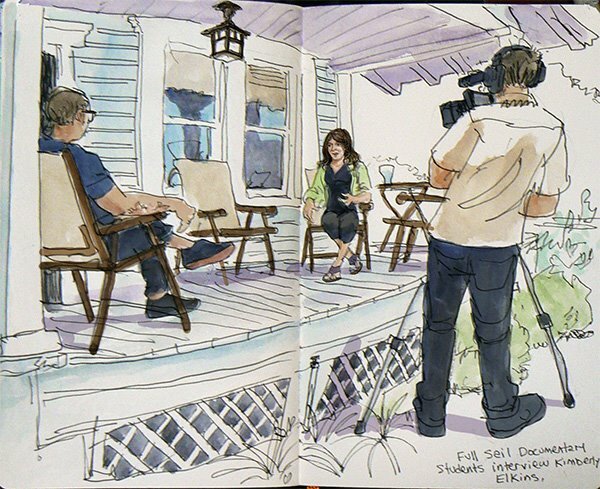 Ever since Kimberly stepped foot in the Kerouac house as the new resident author, I seem to have been buzzing around her like an annoying mosquito trying to convince her to let me do a sketch of her at work. The very first night she stepped foot in the house was the evening when "txt" was being performed. If you recall that performance had some of the most sexually explicit offensive and downright insane dialogue being written by the audience in real time on iPhones and blackberries. Genius that I am, I chose a moment right after the performance to excitedly talk to her about my idea of sketching resident authors. To me she seemed shocked. I realized she was just getting to know her surroundings. She looked out the kitchen window for the first time. I don't know if she felt at home yet. I had spoken to soon. At several other gatherings I threw my proposals at her with no effect. I know that in a crowded social setting I am always a bit adrift. Timing and simple social graces seem to slip when I need them the most. I was excited to discover that two Full Sail documentary film makers, Lyle Kastrati and Robert Navarro, had succeeded where I had failed. They landed an interview with Kimberly. 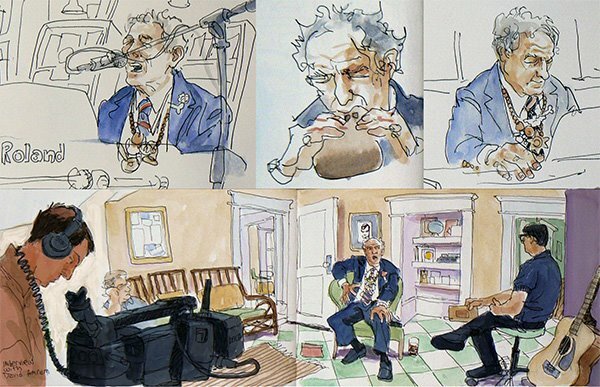 Since I had already sketched a David Amram Interview in the Kerouac house I realized I just had to sit back relax and learn about Kimberly and her writing process through the video interview with her. The interview went great. She is writing a historical novel about a woman named Laura Bridgeman who is deaf, dumb, blind, and mute, she can only experience the world thru the sense of touch. Laura helped teach Annie Sullivan who later became Hellen Keller's teacher. Laura was a huge celebrity in her day. I found it interesting that Kimberly said that no matter how well researched the book might be, some part of herself would be reflected in Laura. Kimberly and I talked in her kitchen this day, I felt for the first time as one artist to another. She told me something that I find reassuring and useful. She said that not having a great memory is actually a good thing for a fiction writer. It allows the writer to feel and interpret rather than just report the facts. I find myself walking that fine line every day writing this blog, am I just reporting, or am I expressing how I actually felt as I did a sketch? 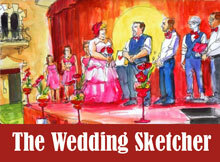 Do my other senses fall to the wayside as I sketch? Is my perception of myself and my identity dependent on the feedback I get from my subject? David Amram is a force of nature, he is a musician, composer, shaman and inspiration. He often stresses the importance of looking for the beauty in the worthless things in life, for those are often the most priceless. David was a good friend of Kerouac and he said Kerouac at any party would always gravitate towards the person in the room who looked the most insecure. It is this giving, encouraging spirit that separated Kerouac from the average artist. David kept stressing the importance of realizing there is beauty all around us, and that a thing of beauty is a joy forever. He pointed out that you don't have to travel to Europe or Asia to find this beauty. It is right in your back yard, just look around. He stressed the importance of what he called, the University of Hangoutology. If you hang out at a spot long enough you truly begin to discover its secrets. He also likes to point out the importance of spontaneity as a part of the whole experience. As part of the presentation David showed a video of a performance he gave years ago at the History Center in Orlando. I was shocked when in the foreground of the first shot I saw a younger version of myself in a stiff button down long sleeve shirt and a full head of hair. I was sketching away as usual unnoticed by anyone. 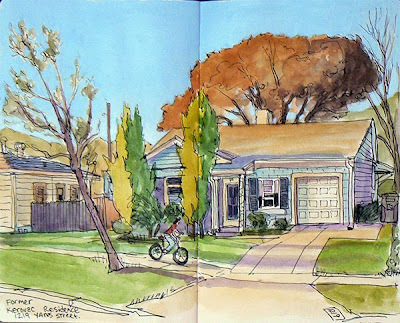 It was that evening that lead me to years later decide to go to the Kerouac house and sketch it. It seems like life keeps coming at me in oblique angles. Lines are no longer straight, but instead curve in and around toward the source. I seemed so young and exuberant in the footage and yet I seemed stiff and insecure, like I was dresses up for the corporate role I had to play. I am left wondering in what ways I have changed since that time. The journey continues and David is still there to remind me to keep my eyes open for the wild, wonderful, frenetic, crazy, spontaneous, outlandish, world that has yet to be sketched. Jack Kerouac's sister Caroline died in 1964. For years her grave was an unmarked spot below an old Maple tree in Greenwood Cemetery in Downtown Orlando. Members of the Kerouac Project arranged to have a stone marker placed on the spot on March 13th of 2009. Yesterday a small group of Kerouac supporters gathered to honor Caroline, who Jack had nicknamed Nin. It was a beautiful morning. As I searched for the site I saw several squirrels scrambling between headstones and then up a tree. The birds were chirping joyously. Once I found the site. I leaned my artists chair up against a tree, leaned back and started to sketch. I knew the dedication would not take long so I had to lay in the background and stones fast. Bob Kealing who was going to pay tribute, had been called away on a news story, he had to cover the Casey Anthony case down at the Orange County Court House. Kim Buchheit took his place and did a wonderful and moving job. David Amram, a multi talented performer, played a hand carved courting flute whose warm tones drifted through the morning air. This days events left me with an impression that art leaves behind a life affirming and ever propagating force that spurs the next generation to keep creating. Get out, find people with amazing stories and listen and learn. David Amram now 78 years old and Pete Seeger about to turn 90 years old are proof that some creative flames burn bright well into old age. 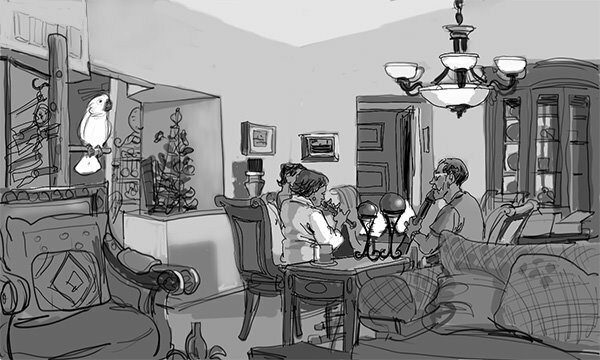 I returned in my first scene of animation drawings to Premise Entertainment. Rather than immediately leave I decided to stay and get sketch done of some of the talented artists now at work in this small production company. In this room are the Effects artists Tony and Enoc are busy working on Cintiqus. Tony West was working on a scene that needed to be rushed since it was needed for marketing. Conversation in the room centered around the strengths of Macs versus PCs and different modeling programs that had been experimented with such as Maya and Zbrush. Tony actually felt that Sketchbook Pro which is the program I was using to do this sketch has its advantages over the program they were using to do inbetweening for the effects work on the film. I however was very impressed watching them work. They could zoom in as close in as they wanted to in order to place line between line. That might not mean much to the casual reader but I have lost some of my eye sight trying to focus on tiny thin graphite lines being inbetweened on sheets of back lit paper. To me these Cintiqus look like the dawning of a new day. They give me itchy fingers. If only they were Mobile. In 1944, Kerouac, Ginsberg and Burroughs all met in the span of two days at Columbia University in NYC. Burroughs began living with Joan Vollmer Adams in an apartment they shared with Jack Kerouac and Edie Parker. Burroughs and Kerouac got into trouble with the law when Lucien Carr, killed David Kammerer in a confrontation over Kammerer's incessant and unwanted homosexual advances. Lucian had allowed Kammerer to hang out with him for years and Richard speculated that perhaps Lucian was a bit of a masochist. The killing happened in Riverside Park in Manhattan's upper west side. After the killing Carr sought out Kerouac, who helped him dispose of the knife and some of Kammerer's belongings. Kerouac may have had a somewhat loose moral code based on necessity yet he was very generous to fellow writers and friends. Kerouac was arrested as an accessory after the fact and served time in jail. He married Edie Parker so her parents would bail him out of jail. The marriage was annulled one year later. This incident inspired Burroughs and Kerouac to collaborate on a novel entitled And the Hippos Were Boiled in Their Tanks. This title came from a WWII news radio broadcast. It was the broadcasters last pitch before signing off. Completed in 1945, the two young authors were unable to get it published, but the manuscript was finally published in November 2008 by Grove Press and Penguin Books. Plans are in the works to make it into a movie. Richard Goodman personally met Burroughs after he sent him a letter and Burroughs wrote him back. Richard had those letters and showed them to people after the talk. Terry and I went down to see the Whole Foods Outdoor Fresh Market. There really wasn't much of a selection when it came to produce. 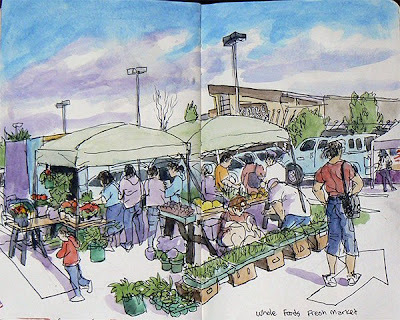 This sketch is of one of the few vendors that offered plants and produce. The rest of the vendors offered cheap trinkets and crafts, non of which interested me. One vendor did have nice ripe tomatoes for a great price, but honestly the trip was a bit of a hassle. The tents take up a large chunk of the parking lot leaving few spaces to park and some genius arranged it so all the traffic leads to a dead end at a traffic cone where everyone must do a 10 point turn to go back the other way. Some folks back up at top speed while others are making the turn. It is a disaster waiting to happen. In front of the store a huge tourist bus was parked in the no parking zone forcing cars to face off into one lane of traffic. A security officer was yelling at the bus driver to get out of there before there was a head on collision. Whatever urban planner designed the traffic flow of this spot should be fired. If Americans didn't have cars this place could be a fun place to shop. 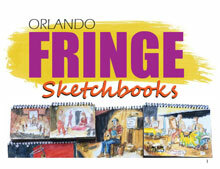 I went down to the Winter Park Art Festival to sketch. 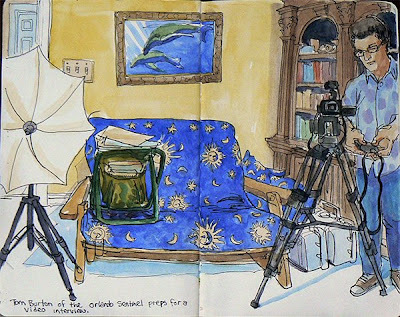 Tom Burton from the Orlando Sentinel wanted to meet me there to get some final video footage of me as I was out sketching. The festival itself was shutting down for the night and everyone was making a mad dash for either the free concert in the park or the local restaurants. 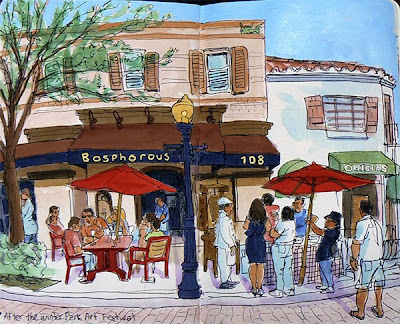 I decided to sit down across the street from Bosphorus, a Turkish Restaurant. Tom simply hovered around shooting me and the scene I was sketching from every conceivable angle. It was a little distracting when he shoved the camera between my head and the sketchbook, I actually had to crane my head to the side to see what I was doing. It was convenient that the street was shut down since Tom would at times sit down in the street for low angle shots. It was fun having someone there to share the experience with. For instance he noticed that the lady holding the umbrella was there for a very long time. We both conjectured that she might have been trying to keep it from blowing away. It was interesting how often he focused on close ups of my nervous lines being thrown down on the page. The sketch was fun, I was afraid that I might tighten up with all the attention but the opposite was true. I loosened up and flowed with the experience. The jazz music in the park also gave me a beat to set the pace of the sketch to. When Tom was shooting on the opposite side of the street I started to notice myself bobbing my head to the beat and I thought, "maybe I should look a bit more serious, I am an artist after all....what the heck, go with it!" Brian Feldman has devised another amazing performance piece. He plans to sleep for 50 hours while allowing people to walk over him. He is sleeping in a wooden box built with two by fours outside on the sidewalk . On top is a black metal grid and then a sheet of Plexiglas so people who walk over can get a good view of Brian sleeping. When I got to the site I really didn't know how I would get a drawing. You can not really see Brian from the street or sidewalk. Only when You walk over him do you get a full view. I finally decided the only option was to walk right on top of Brian, sit down on my stool and sketch him from that vantage point. 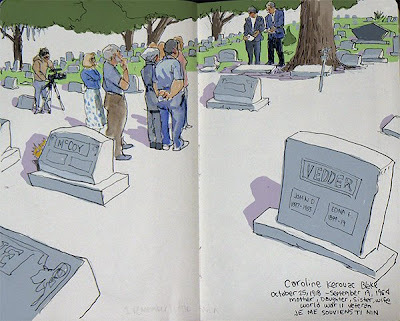 It was rather like sketching a corpse at a wake while sitting on the coffin. Two young women stopped by and wanted to walk over Brian. I got out of the way, and they started across. They hesitated however and asked, "He won't peek will he?" They were concerned because they had dressed on. Brain however was wearing a mask, perhaps for exactly that reason. When they left I climbed back up and resumed my sketch. A student from Valencia College named Dariel wandered by and we both recognized each other. He is a young tan fellow who could well be a surfer. During my visit at Valencia he really seemed to get the point I was stressing, which was to get out in the community and take art and academics outside the classroom. He related a story about a character he met who he thought was homeless who was taking pictures of graffiti. This fellow was actually an artist from Jamaica who was traveling the world on the cheap. The fact that he related this story was a real highlight for me. That meant he understood the idea of art as an adventure. Feldman's performance makes me wonder, am I truly living everyday fully? Am I fully awake? Do I let people walk over me? Brian will continue to sleep till 6PM on March 22nd. So if you want to walk over him, go to Frames Forever & Art Gallery at 941 Orange Avenue, Winter Park, FL. It is a half mile from the Winter Park Art Festival. I went to Valencia Community College today to visit with students in a fundamentals drawing course. The instructor, Kelledy, asked me to tell the students about my background and about how I got involved in my latest endeavor which is, as you know, posting a drawing a day to this blog. I am seldom asked to share my thoughts about what I love most in life which is to draw and share my drawings with others, so for me it was a real treat. The students seemed really interested and with any luck my simple sketches might inspire one or two to look around and slow down to sketch and observe. 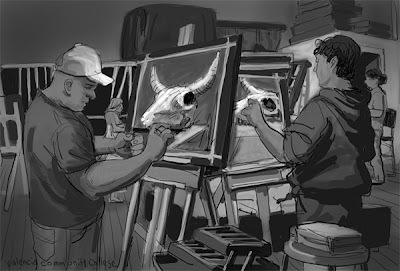 The students were working on still life's from buffalo skulls. 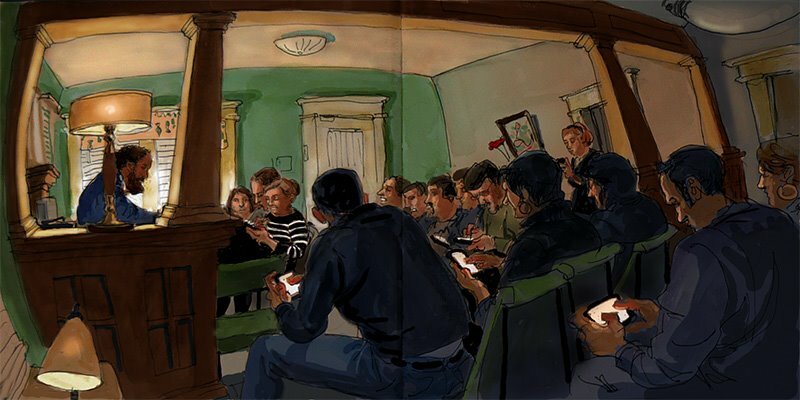 They were using mostly charcoal on large sheets of 18 by 24 inch paper with lots of tooth to hold the media. They constructed the compositions in a cubist manner then used cross contours to further refine the shapes. Finally everything was delicately shaded. I pulled out my Tablet and sketched for a short while. The room was a cavernous space with a huge skylight high in the center of the room. It really bought me back to my college days in NYC. I decided To go to Fiddler's Green on the Day after Saint Patrick's Day. The outdoor beer garden was still set up in the parking lot but otherwise the scene was oddly serene. There was a steady stream of patrons walking in the front door from the parking lot. This pub is located on a very busy intersection so more often than not a bus or car was blocking my view but I chose to keep my eye moving around the scene sketching whatever could be seen at any given time. I was leaning up against a metal pole for some store signage and every time the wind blew, the pole would lurch causing me to be shoved from side to side. This might explain why the line work is a bit looser in this sketch. Shamrocks still were hanging everywhere, and green remained the color of the day. It turns out that there is a Sonny's Barbecue right across the street and boy did it smell good. I suspect I will be back. 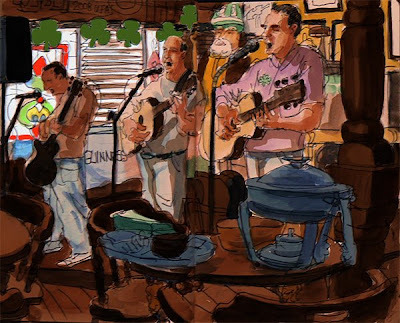 A Pint and Some Music? This group was playing when I walked in to Fiddler's Green. The place wasn't to crowded yet and happy hour had just begun. They had a warm sound and I quickly got to work, however they only played one song. 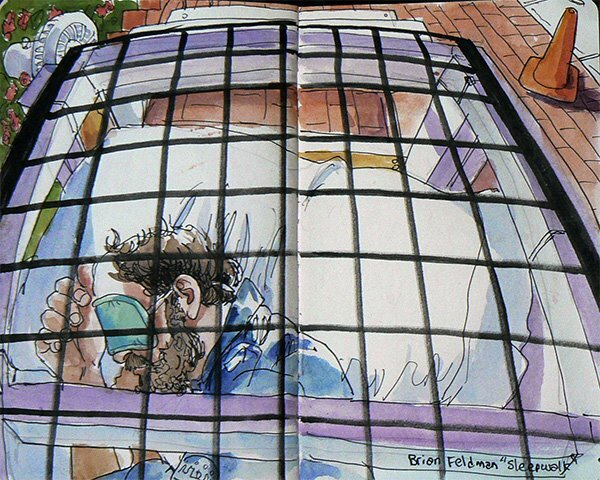 As a matter of fact I had to draw the guy closest to the window as he was taking his guitar off to put it in the case. 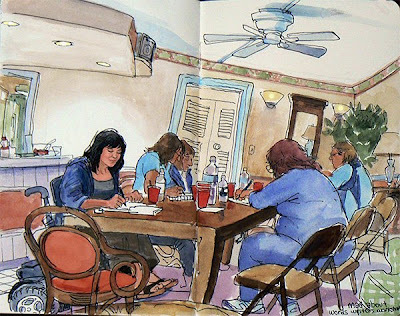 I stubbornly kept sketching, filling in details by peeking at the group as they sipped drinks over in a corner table. I never even caught the name of the group. I was surprised that the entire time I was working on this sketch, no one asked me if I wanted a beer. In this economy you would think they would be pushing beers a bit harder than that. I gave the waitress a decent tip anyway since I ordered a beer when I moved closer to the bar and I got decent sketches out of the evening. For Saint Patrick's Day I went to the most Irish bar in town, Fiddler's Green. I ordered a cup of Guinness and sat back and watched the patrons. The couple right in front of me were very much in love. He never stopped touching her. Most of the time he had his hand on her knee as they spoke and sometimes he ran his hand through her hair and they would often hug and kiss. Other patrons were more focused on the soccer game on the televisions. But as an artist I was happy to record the public display of affection being exhibited in the center of the bar. I struggled to see into the darks of the dimly lit interior. Toward the end of the drawing I started taking longer sips of liquid courage as I pushed the watercolor closer to pure blacks. When the loving couple got up to leave, I was surprised to find out that the man was on crutches. I hadn't noticed the crutches once while I was sketching, he had hidden them well under the bar. I was left wondering what had happened to his leg, was it a sports accident? Had be been involved in a fender bender on Interstate 4? Oh well, I may never know. and I'll see ya some day in Fiddler's Green"
Terry invited over Melissa and Roger to play recorder music with. This time rather than sit right next to the performers, I sat back in the living room relaxing on the couch. Zorro our cockatoo seems to enjoy listening to the music as well since he remained quiet and attentive. Later Melissa pulled out her viola and then the sound of the trio became truly sublime. After the rehearsal we all sat down to a dinner of shrimp and orzo. The conversation of course turned to the economy and every one's hope that they could live life day to day without having to worry about tomorrow. We all recognize that we might have to cut back in order to get by, but simple pleasures like music and art do not really cost that much to create. In 1893 Louis Comfort Tiffany designed and exhibited this Byzantine inspired chapel at the Chicago World's Columbian Exhibition. Men would take off there top hats in respect. The chapel was hailed as a virtuoso performance of the arts of mosaic and glass. Hanging from the ceiling is a large cross shaped electrolier which made use of the latest technology of the time, the electric light bulb. After the Chicago Exhibition the chapel was bought by Mrs Celia Whipple for The Cathedral of Saint John the Divine in New York. It was installed in a dark crypt and used as an actual chapel for about 10 years but was then abandoned and left to deteriorate. Tiffany, upset about the condition of the chapel arranged to reacquire the remaining parts and bring them to his Long Island Estate, Laurelton Hall. Tiffany then lovingly restored the chapel and replaced the lost and stolen parts. When Tiffany died in 1933 his estate was scattered to the winds. In 1957 the Laurelton Hall estate burned to the ground. Luckily the chapel was in a separate building but it once again fell into disrepair. After the fire Jeanette McKean the Morse Museum founder, and her husband Hugh McKean visited the hall and bought all they could to Winter Park Florida. Some callous moving men threw furniture and a used tire on top of the chapel parts assuming they were hauling junk. Once in the Museum the chapel was once again lovingly restored over a three year period. Tiffany viewed the chapel as "a temple of art, not of worship." 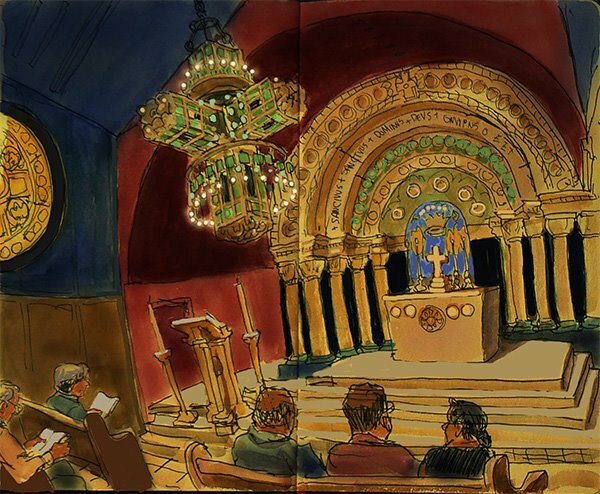 While I sketched the chapel, a woman tried to take a picture with her cell phone. A guard quickly appeared and shouted that no pictures were allowed. As he walked past me he said "Sketches are fine buddy, you have the right idea". Tom Burton from the Orlando Sentinel called and asked me if he could do a video interview for the online division of the local newspaper. It seems a British artist showed him my blog and he considers it news worthy. I thought I would be nervous in front of the camera but Tom had a friendly unassuming manner that lead me to open up and discuss the project in extensive detail. The fact that the he was a photojournalist also made it easy since I knew I was talking to a kindred spirit. While setting up for the interview I had to wear a wireless mic. That mic for what ever reason kept failing. In the drawing Tom is once again looking at the wireless mic and resetting it's channels. This technological glitch gave me just enough time to sketch the situation as it unfolded. It is sort of like sketching the dentist just before he pulls a tooth. Tom would ask a question and then had a way of sort of receding into the background becoming the proverbial fly on the wallpaper. He would only interject another question once my thoughts had run there full course. I had a great time. I will post a link once I know the video is edited and online. Post Script: Now for something completely different, Ambienthinker has offered important comparative breaking news about Picasso and a bicycle race. I like totally got to meet the cast of Legally Blonde The Musical along with 80 other 13 year old aspiring actresses and stage moms wearing hot pink and sequins. The event was hosted by Barnes and Noble and it was a smash hit. Becky Gulvig plays Elle Woods in the play. She went to a casting call right out of high school with thousands of other girls and was picked to be the understudy for Laura Bell Bundy in the Broadway production of Legally Blonde. She admits her life was tuned upside down. The other cast members wanted to stress the landing such a dream job on the first try isn't par for the course as an actor. Most actors must go to hundreds of auditions and live in quiet desperation until they land a part. Several other members of the cast are runners up from an MTV Reality show "The Search for Elle Woods". I was particularly impressed with the story of the bulldog Nellie who plays Rufus in the play. Nellie was discovered in a dog shelter in Hoboken and was found to be a true ham. From rags to riches, she now finds herself touring the country with a talented band of actors. Nellie was on hand and let out a loud bark once in a while to express her opinion. I must admit Legally Blonde is a guilty pleasure. Gulsvig says every one can learn from the character of Elle. "If you stay true to yourself and work very hard you can get what you want. You just can't let other people's judgements about you - get you down." Jack Kerouac was born March 12th, 1922. Were he alive today he would be 89 years old. He died at the age of 47 which is how old I am today. In his memory I went to the house where his sister Nin lived through the late 1950's at 1219 Yates Street in College Park. Jack often came to stay starting in 1954 for varying lengths of time. When he was here in 1956 "On the Road" was about to be accepted by Viking Press for publication. Jack then rented rooms in a house for himself and his mother around the corner on Clouser Avenue. He soon shipped out to Tangier. 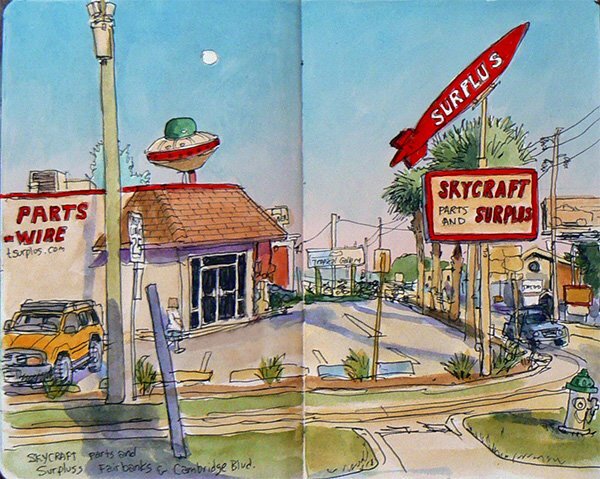 Ed White suggested to Kerouac that he sketch the streets like a painter but with words. Kerouac filled 15 pocket sized notebooks with "sketch poems". After completing "On the Road" Jack sat down at his typewriter and wrote the manuscript that came to be known as "Book of Sketches". As an artist who has also taken to the streets I identify with that endeavor. This house sits in an old quiet neighborhood. Weeds sprout up between the sidewalks and curbs are broken and worn with age. Children are at play everywhere. Three girls next door ride there bikes and scream to each other until mom calls them in for dinner. A train whistle can be heard in the distance. be my childlike self forever. Darlyn is a former Kerouac house resident author and today lives in East Orlando. On Tuesday nights she and her fiance Brad Kuhn have a writer's date night. They both sit at the dining room table facing each other and tap away on there respective laptops. They both have full cups of coffee as they work into the night. Darlyn who is petite in size uses two large pillows from the living room to prop herself up in the chair. When she writes alone, she works at the small antique desk seen behind her in the corner of the room. This writing duo met at the Kerouac house on September 17th which will be the date of there wedding sometime in the future. When asked how long they work on these date night sessions, Darlyn said "we generally stop when we start playing footsie under the table and begin to feel frisky." I bought Darlyn's book "Red Wax Rose" prior to doing the sketch since I felt it important to know something about her work since it might influence the sketch. This book of short stories and poetry is filled with gut wrenching emotion. At times I felt a surge of joy and sorrow at the same time. She is also the hand behind an online writer's resource called sunscribbles which offers news about Florida writers. drinking poetry like cool water. eating poetry for breakfast with good strong coffee. The full moon rises over Skycraft as the sun sets on the opposite horizon. Skycraft is a store for the inventor, tinkerer and do it yourselfer. Inside can be found a treasure trove of parts and wiring for anything from robotics to solar panels. There is such a wide variety of wires and connectors inside that it boggles the mind. They even have telephone booths in case you happen to need one of those. I have been inside only once. I bought some tiny solar panels which I haven't quite figured out a use for yet. That is why I stay away, I would just buy stuff because it looks cool, I can not help it, gadgets intrigue me. Gadget innards intrigue me more. While sketching I was enveloped in a cloud that looked like snow. I caught one in my hand and I believe they were seed pods from something like a cat-o-nine tails. The wind spiraled them around and they rose into the sky. 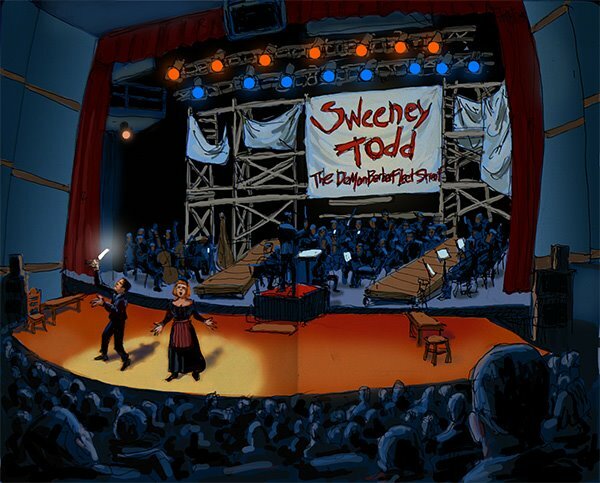 The Orlando Philharmonic and Mad Cow Theater joined forces to bring Sweeney Todd to the Bob Carr Performing Arts Center. Davis Gaines performed the title roll and Faith Prince performed as, Mrs. Lovett. This production far exceeded my expectations. Gaines voice resonated with loathing and impatience. Faith also had a magnificent performance. Having seem Tim Burton's movie last year, in which a girl with a thin mouse of a voice sang as her window, I cringed at the thought of listening to Christina's song again. However, Shelly Cooper performed with a warmth that mesmerized. The whole cast deserved the standing ovation that they got. The hall was as full as I have ever seem it. 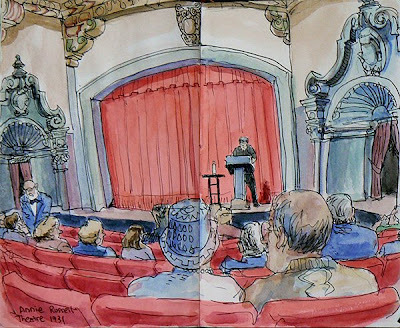 I quickly sketched the stage before the play started and when the lights went down, I had to stop since I could no longer see the sketchbook. I tried lifting the book off my lap up to my chest to catch some ambient light off the stage, but the man seated in front of me was tall and had a huge head. His head eclipsed all available light. The lady seated beside me seemed amused with my contortions. During intermission she asked "Are you a stage designer?" I replied "No I am a blogger". She pulled out her iPhone to show me the picture she had taken of the stage. 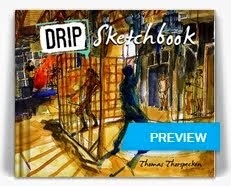 Although I might complain, I prefer the challenge and personal view point of a sketch. Besides before the play starts they always announce that there is to be no photography. They never say no sketching. After her riding lesson Terry washed Trick and used a scraper to get most of the water off. She then let him wander about eating grass in the sunlight so he could dry off before going back in the barn. Trick left a sizable gift on the washing platform which had to be swept up and put in the portable poo bucket. These horses are truly pampered. While I was sketching, Trick would chew the grass and kept stepping forward toward me. For whatever reason he must have thought that the grass right under my feet was the most delectable. I would back up a few steps and sure enough he would end up nibbling right at my toes. 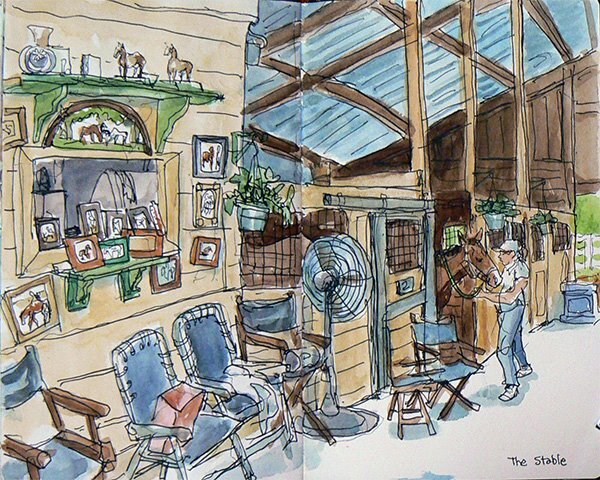 Today Terry had another lesson at the Snow Kissed Stables, M&M Equestrian Center. It was a beautiful morning for a ride. For the first time the sweet smell of orange blossoms filled the air. Pink blossoms around the barn were just starting to bud. Spring is in the air. 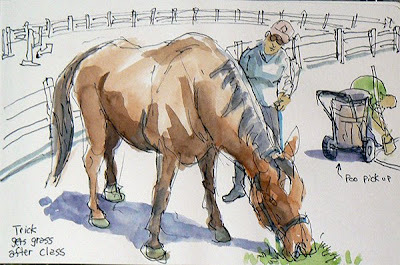 When Terry was in the barn getting Trick ready for the ride, I could hear her constant sneezing. She is allergic to the pollen in the air and I suspect she might be allergic to horses but that certainly will not stop or dampen her experience. Emily her instructor is patient and offers constant advice. She does practice tough love sometimes to make a point. She shouted out to Terry once, "See this pebble in my hand? 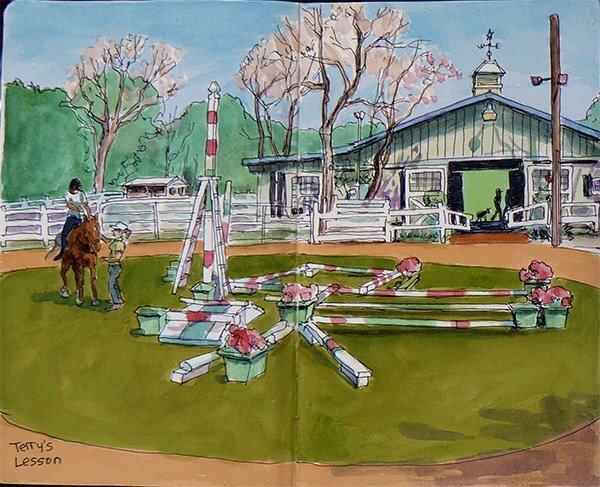 I am going to throw it at you if you do not sit centered in the saddle." Wouldn't you know, Terry started riding centered in the saddle. I went to the OMA last night for "First Thursdays". 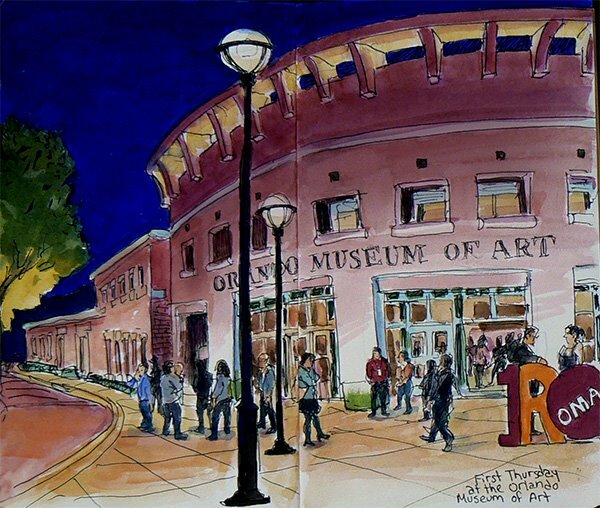 Every first Thursday of each month the museum hosts art created by local artists for one night. The evening usually has live music, food and booze. The cost to get in is $10. Food and booze are extra. I thought Terry might want to go but she wasn't picking up her cell phone. When I got to the museum I decided to sit on the edge of a fountain and sketch the entry. I liked watching the various individuals waiting for dates and the warm welcomes when people are reunited. Like myself many people were on there cell phones trying to figure out why they were left waiting. The event only lasted till 9PM so by the time I finished sketching I discovered that there was only 15 minutes left to go before the museum closed. I had totally lost track of time. The exhibit fit neatly into a small room right off the lobby. One artist had really nice resin sculptures of a dragon and werewolf. Another artists acrylic paintings of movie characters were really fun and quirky. I should have taken cards. Brian Feldman of "txt" fame was also exhibiting himself as a performance piece. Brian stood with his back against a wall being filmed by a video camera which projected a large image of his face on the wall beside him. Brian was practicing method acting by trying to make himself cry. His face was contorted in a harsh grimace but I didn't notice any tears. Either he was cryed out or he was unable to tap his inner sorrow in such a loud party atmosphere. I unfortunately didn't have time to get a decent sketch of him, but once again he held my attention far longer than any painting or sculpture in the room. His performance reminded of a short story entitled "The Hunger Artist" by Franz Kafka, it has a surreal disturbing quality, that I liked. Bravo! Terry and I went to the civil war fashion show at the Orlando Regional History Center. 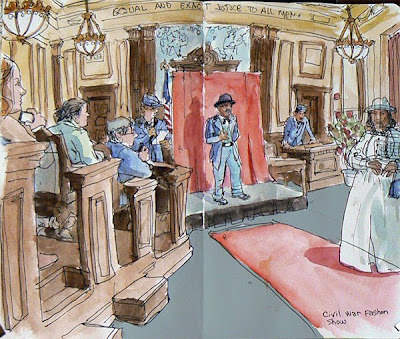 The show was staged in a beautiful old court room. Featured were clothing worn by men, women and children from both the North and South, free and enslaved. A local radio personality, Downtown Billy Brown, and the History Centers Mike Brown hosted the show. There self deprecating humor set the stage for a lively and entertaining event. The entire crowd gasped when a woman came out in her many layers of undergarments. They were equally shocked when a young girl came out with her entire neck exposed indicating she was old enough for marriage. The saying above the judges bench reads: Equal and exact justice to all men. This seems a reminder that woman would not have equal rights under the law for another 60 years or so. After the show I talked with some of the reenactors and decided I would go to the next reenactment and embed myself with the 2nd Florida Volunteer Infantry Company E, The Hammock Guards, lead by Captain Clay Kearney, to sketch the battle as a Civil War Correspondent. I have about 3 weeks to fashion an 1860s civilian outfit from Goodwill clothing. I may actually go to this first battle as a 21st century civilian, since shopping for clothing is always a painful and exhausting experience. 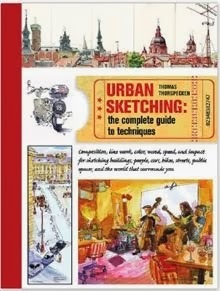 I will see what can be sketched from a spectators vantage point. I will start this post with a comment from former Orlando resident Cherie from Dorchester, MA. "Publix No. 19, you live forever in my heart. When I lived downtown, we drove to your lot just to see the giant fin. We called you Happy Publix. Just seeing you made us smile. When I lived down the road, I was a lucky girl. The staff always seemed friendlier than other markets. They had theme days and dressed as cowboys and such. Sometimes they just wore shirts that said "No. 19." So cool. After Skycraft, it is my second favorite landmark in Orlando. I'd forgo the wide aisles and expanded hummus selection of new supermarkets just to see that neon fin again..."
I pulled into this Publix parking lot when I got lost once looking for the Kerouac house in College Park. I just wanted to use the lot to turn around but the 1950s neon caught my eye and I knew I would have to go back. The original store was closed in 1998 after being open for business for 32 years. Plans were hatched to build a newer more contemporary market, but College Park residents wouldn't stand for it. The architects had to remodel the store and this 1950 retro look is the result. The Photo Mart scene in the Steve Martin movie "Parenthood" was shot in the parking lot of the original store. I returned to the Kerouac house to see a second performance of txt. I realized after my first sketch that the performance wasn't so much about the man reading the text messages, Brian Feldman, but it was about the uninhibited comments that came from the audience who remained anonymous writing the script on there iPhones and PDAs. 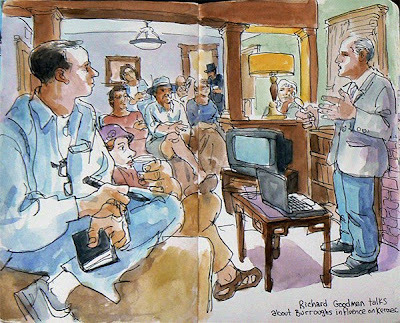 This time I sat in the far back corner of the living room so I could sketch as much of the audience as I could. The performance was again peppered with sexual innuendo and some paranoia. This time Brian was asked to do more physical actions such as jumping jacks. One unexpected incident occurred when he said, "Get me a cup of water, I am parched, this isn't in the script I really need a cup of water". Kim darted into the kitchen to get a cup of water. After the performance Brian indicated that the call for water was just another text message. I found myself laughing louder than ever at this performance. The uninhibited mind is a strange and quirky beast. I was fascinated by the glow of the PDAs through red thumbs and fingers. 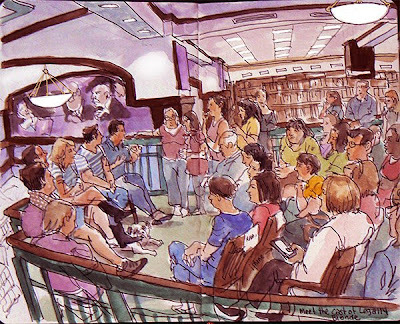 The small room crowded with people again made the reading feel like a digital seance. Wall Street Journal theater critic Terry Teachout gave a talk on what he feels a theater critics roll is in society. He told a story of how he met a critic once over a drink and when he asked his fellow critic what he was up to next, the critic perked up and said with glee that he was about to pan a play. He explained that to many critics go into a production with a review already set in there mind. He feels that to many critics are not competent enough to right reviews. The first 15 minutes of any play always have the audiences full attention. At that 15 minute mark the play ether continues to grab the audience or they are lost. He always goes into a play wanting to write a good review. Terry confessed that his first love was music, but at a painful point in his life he had to admit that he did not have a creative spirit. He found he was a better writer than a musician. Therefor he always approaches a theater review with a bit of reverence, respecting the very act of putting on a show. He explained that theater is as vibrant as ever, but in these uncertain economic times it is important that people go to the shows. The very future of theater depends on it. Terry's weekend horse riding lessons continue. She started going to a new stable since it is closer to home and the lessons are cheaper. Terry's new trainer, Stacy, is offering advice on every aspect of riding. The last trainer Terry had at the previous stable only shouted out "More legs, more legs!" Terry was never sure what he meant by that. The main thing I notice about this new stable is that there are no flies. Nothing makes sketching harder than having flies buzzing in your ears. I also like that this stable looks more like a traditional barn. There are 4H trophies and pictures everywhere that indicate that raising and riding horses has been in the family for a long time.